The headline above may mean little to you if you don’t live in Canada and watch our national broadcaster, CBC. 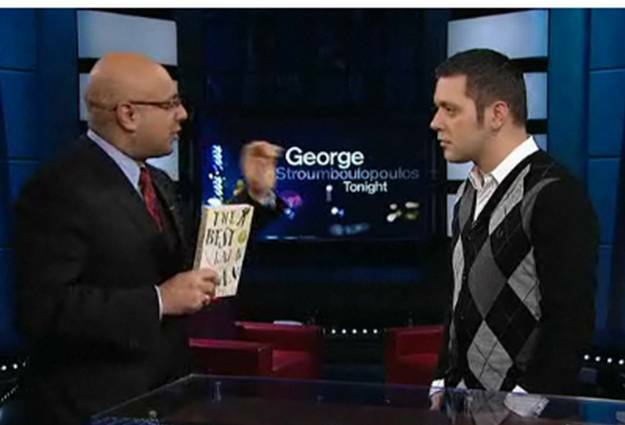 A popular late night talk show, called George Stroumboulopoulos Tonight, is led each weeknight by the one and only George Stromboulopoulos (which is quite convenient, given the name of the show). He’s hip and topical and has gathered quite the following. I quite enjoy the fast pace of the show and George’s interviewing style. Anyway, I was watching last Wednesday night, the same day of the Canada Reads announcement, and was shocked to see my defender Ali Velshi talking to George about The Best Laid Plans. It’s probably the largest audience ever to see my novel at one time. Thanks Ali. It’s great to have you in my corner. A few weeks ago, Mandy Brouse from the wonderful Waterloo book store, Words Worth Books, emailed me to say she would soon be at a reception at Rideau Hall in Ottawa, the residence of the Governor General. Our new GG is David Johnston, the former President of the University of Waterloo, and he was a regular Words Worth customer. She asked me if I could inscribe a copy of The Best Laid Plans for her to give him when she was there. I can tell you, that was an easy question to answer. Earlier this week, Mandy sent me what she called in her email, “the Money Shot” above. It’s very cool to think that right now, somewhere in Rideau Hall, The Best Laid Plans is sitting on a table, or a shelf, or perhaps even on the GG’s nightstand. 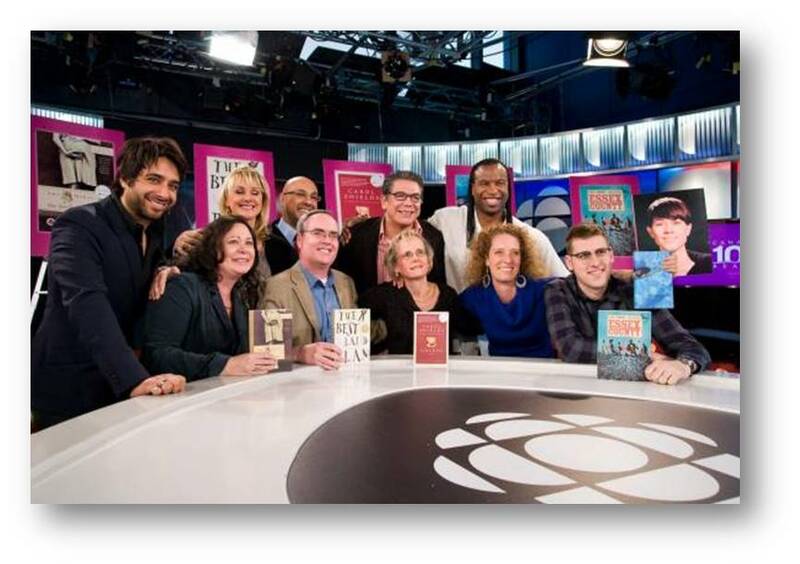 CBC announced the five Canada Reads finalists today along with the celebrity panel. 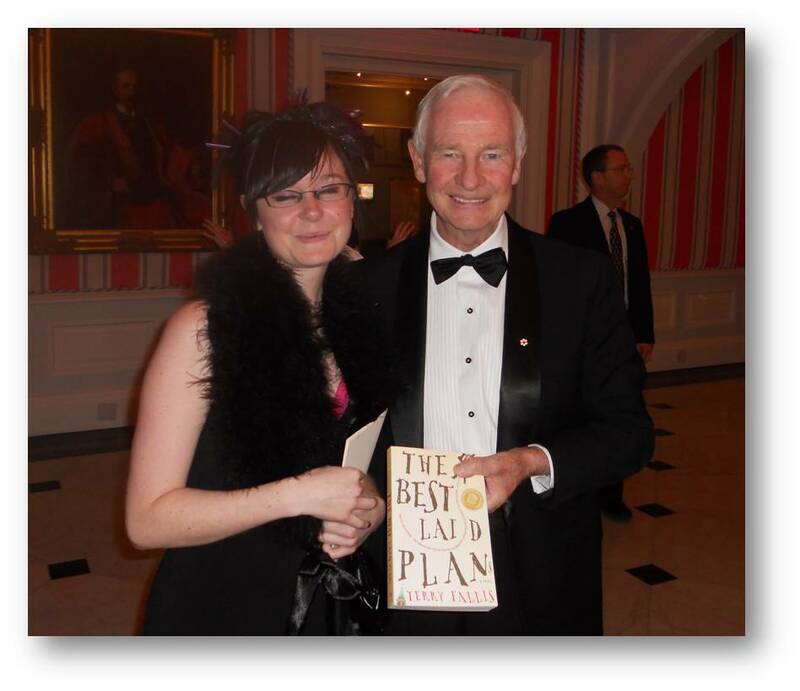 Miraculously, The Best Laid Plans is a Canada Reads 2011 finalist. I briefly couldn’t breathe when I heard the news about ten days ago from Doug Pepper, the President of McClelland & Stewart. It’s been one of the toughest secrets I’ve ever had to keep. The publishers are informed in advance so they can make sure there is adequate supply of their book in stores when the announcement is finally made. Needless to say, I was shocked and overwhelmed. In fact, I was a basket case forÂ a few days. Canada Reads is a big deal in this country and it’s a huge boost for the authors who make it to the final five. 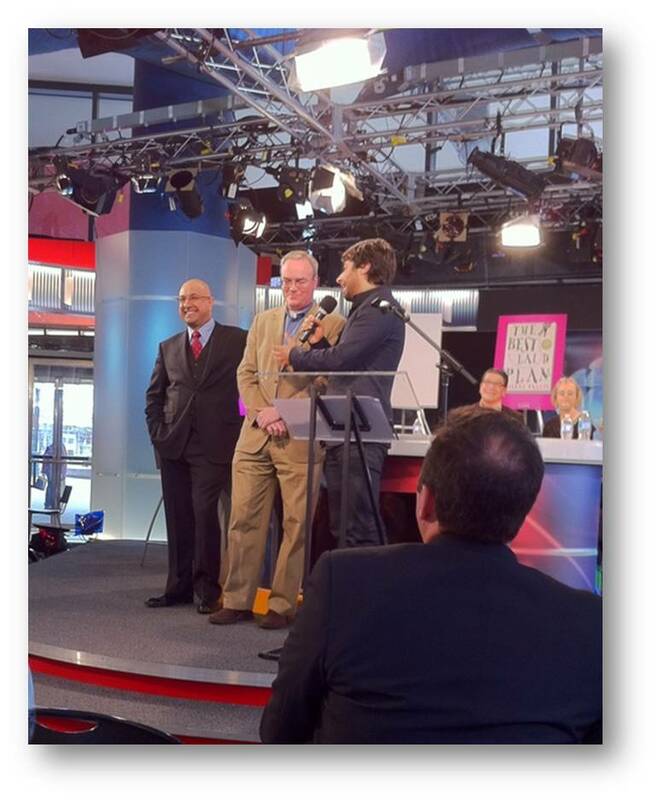 When I arrived at CBC this morning for the announcement, I only knew that TBLP was a finalist. I didn’t know the other books or who would be defending my novel in the Canada Reads debates in February. I was thrilled to learn that the high-flying and very talented Chief Business Correspondent for CNN (yes, CNN! 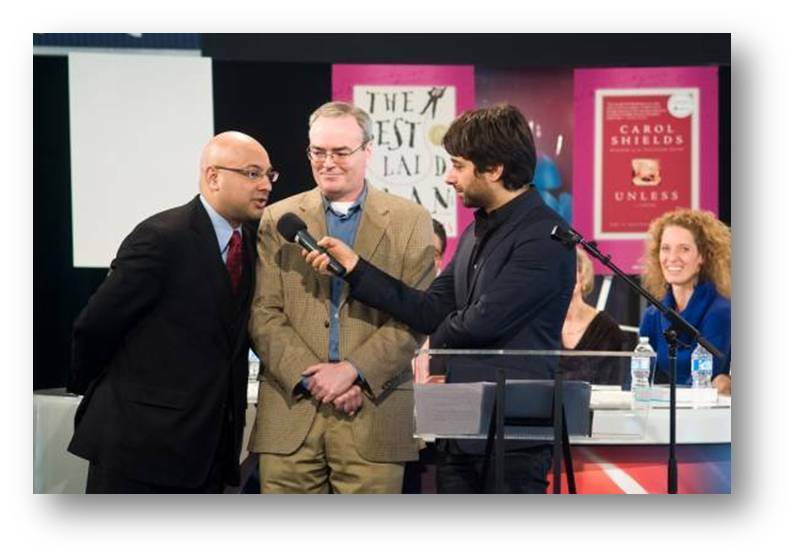 ), Ali Velshi will be going to bat for TBLP. While I haven’t seen Ali for more than 25 years, he volunteered on a political campaign I was helping to organize back in 1984 when he was just 14 and I was 24. (I seem to recall we were often engaged in very important political organizing work together, like stuffing envelopes and licking stamps.) It was wonderful to reconnect with him today and watch how skillfully he handles himself. He really understands TBLP. And, he’s articulate, funny, thoughtful and competitive – a perfect combination for a Canada Reads panelist. Update: Here’s the video of Jian Ghomeshi introducing the panelists and the books each of them will defend. Should be a fun literary rumble! 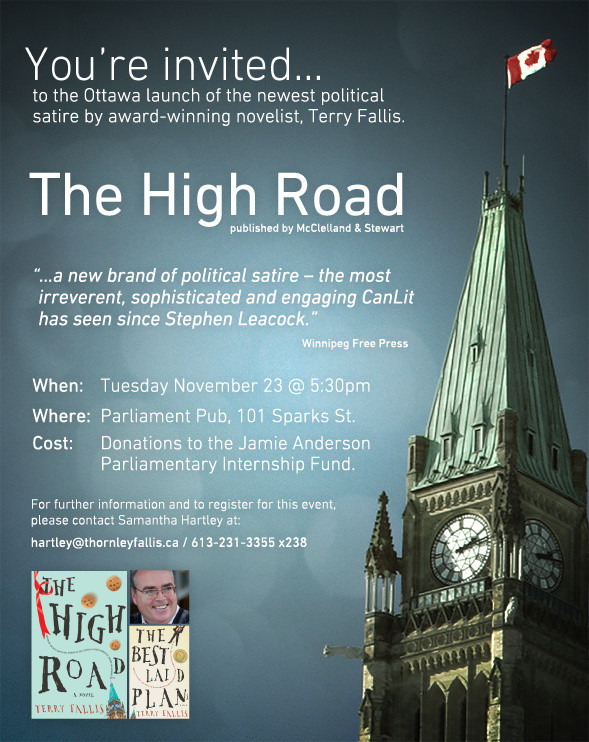 My colleagues in our Ottawa office are very kindly organizing a launch event for The High Road to be held the evening of November 23rd. We’ll be meeting, appropriately enough, at the Parliament Pub on Sparks Street, just a stone’s throw from the Hill. All are welcome. We’ll be raising money for the Jamie Anderson Parliamentary Internship Fund, a very worthy cause. My old friend, Rob Oliphant, Liberal MP for Don Valley West, will say a few words. (Rob is also a United Church minister. Some 23 years ago, he officiated as my wife and I tied the matrimonial knot in a 200 year old wooden church, near Wolfville, Nova Scotia.) I expect I’ll yak for a moment or two and read a brief section from The High Road. Of course, the real point is to socialize and enjoy a gathering of political collaegues and friends, and anyone else who’d like to come.The affairs gets started at 5:30, so you can come right after work. I’m looking forward to it and I certainly appreciate the efforts of my friends in Ottawa to pull this together. 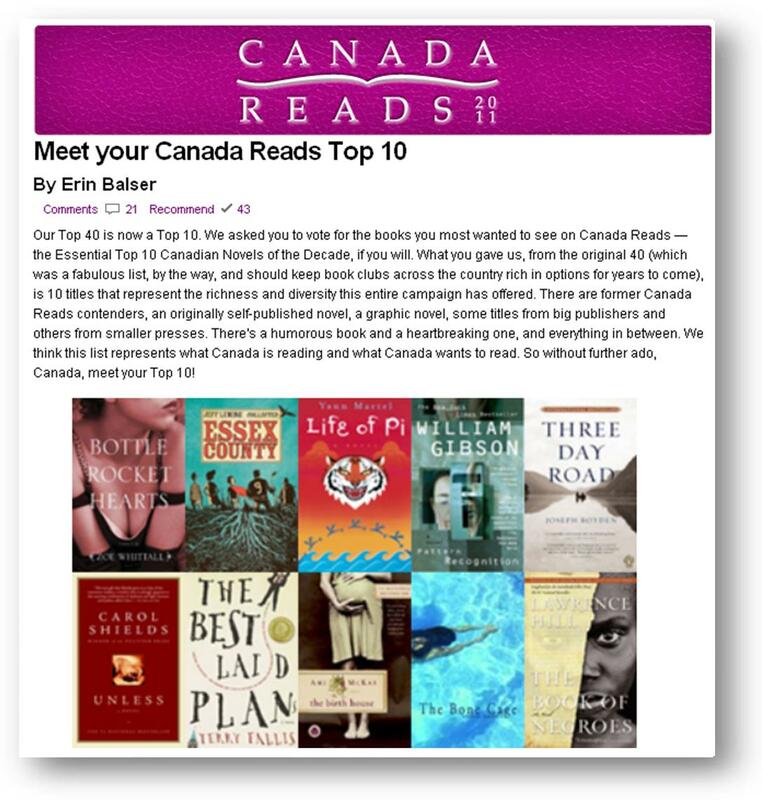 The announcement of the Canada Reads Top 10 is coming this Tuesday, so I thought I’d better dip my oar in the water one final time on the subject. 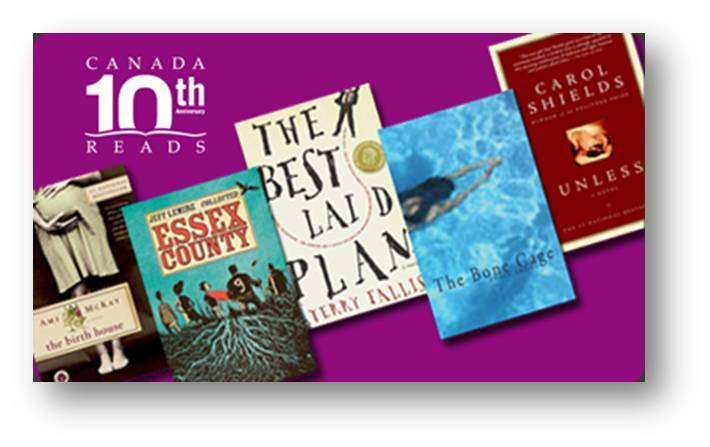 Having the The Best Laid Plans declared one of the Canada Reads Top 40 Essential Canadian Novels of the Decade was such a wonderful surprise. I certainly never expected to see TBLP on the list. So with the voting for the Top 10 slated to close at midnight tonight, I really just wanted to thank all of you who have clicked your mouse in my favour. And let there be no doubt, this is a big deal. 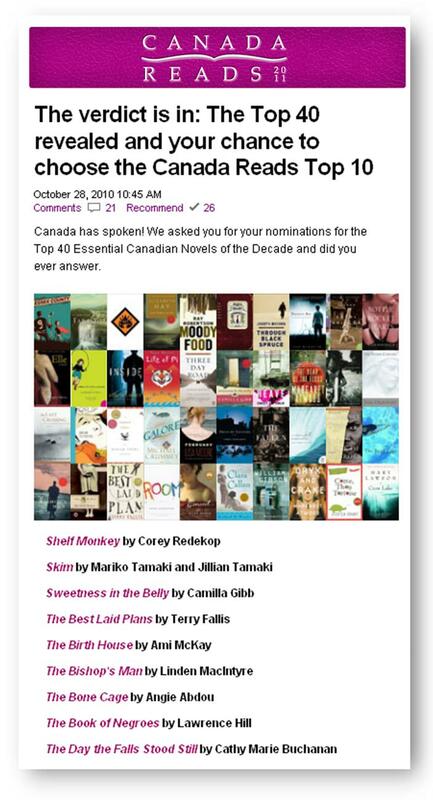 Over the years, the books that have made it to the Canada Reads shortlist have all enjoyed a substantial sales kick. So whatever we might think of this particular methodology for establishing the Top 10 list, making it to the next stage in the process could really mean a lot to the lesser-known authors in the running (like me for instance). So thanks so much everyone. I’m grateful for all the support, whatever happens on Tuesday when the Top 10 are unveiled. I already feel as if I’ve won just by being in the Top 40.